Ryan Allen Hoffman, age 35, of Mechanicsburg, and his fiancée, Julene Jarosky, passed away tragically on Sunday, November 25, 2018 in a condo fire in Harrisburg, PA. Ryan was born Sunday, November 13, 1983 in Pensacola, FL to Richard “Rick” Allen Hoffman and Rita Ruth (College) Hoffman. Ryan leaves behind his parents, Rick and Rita Hoffman of Mechanicsburg; his brother, Rusty Hoffman and his wife, Paula, and their children: Finlay and Myla all of Mechanicsburg; his paternal grandfather, Daniel Hoffman of New Enterprise; his maternal grandfather, Eldon College of Chambersburg; as well as many other family and friends. He is preceded in death by his paternal grandmother, Shirley (Fluke) Hoffman, and his maternal grandmother, Edna “Nanny” (Shaffer) College. Ryan graduated from Cumberland Valley High School in 2002, where he played varsity football. He studied HVAC at Harrisburg Area Community College. Ryan was currently employed by DVL Group as an environmental parts coordinator where his co-workers described him as a hard-working, dedicated individual. Ryan was an avid fan of the Pittsburgh Steelers, Penguins, Pirates, and Penn State. He enjoyed the outdoors and spending time in nature. Ryan always knew the best places to eat and loved experiencing new places with Julene. All are welcome to join Ryan’s family at his time of remembrance on Saturday, December 1, 2018 from 4:30 p.m. until time of service at 6:30 p.m. at Myers - Buhrig Funeral Home and Crematory, 37 East Main Street, Mechanicsburg, PA 17055; with Pastor Trent Thompson officiating. Ryan will be laid to rest in “Ryan’s Orchard” at the convenience of the family. Cremation was private. The family will not be accepting flowers but instead invites you to contribute to the living memorial “Ryan’s Orchard” which will be planted in the spring on the family’s property. This will be Ryan’s final resting place. Donations of any amount are welcome and greatly appreciated. To donate, simply click on the green “Appeal for Donations” button on Ryan’s obituary which appears on Buhrig.com. Donations by check should be made payable to Myers - Buhrig Funeral Home and Crematory, 37 East Main Street, Mechanicsburg, PA 17055. Credit card donations may be made by dialing (717) 766-3421. The family thanks you for your kind contributions. 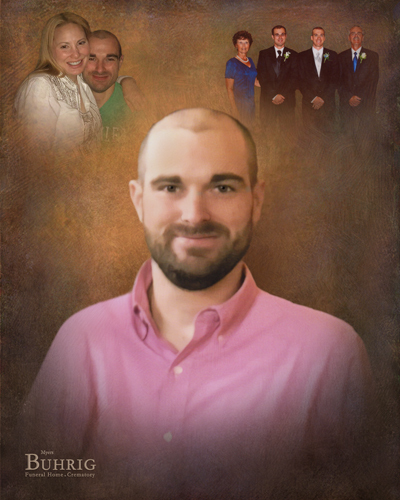 Ryan’s family has entrusted his care to Myers – Buhrig Funeral Home and Crematory in Mechanicsburg, (717) 766-3421. Read Ryan’s full obituary, view his memorial video and portrait, and sign his official guest book at Buhrig.com.